Recent application of Radcon Formula # 7 on the platform of the Petroleum Liquid Natural Gas Terminal of the “Barra do Riacho”, in Aracruz – ES (TABR _ Petrobras). 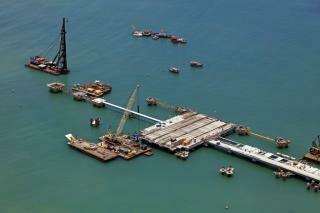 The platform was built by the Rio de Janeiro office of Christiani Neilsen Engineering S/TO. Radcon Formula # 7 was specified as an excellent protection for the concrete and reinforcement which are subject to chlorides and aggressive elements. Marine environments are particularly harsh on concrete and the reinforcement within the concrete, so Radcon is an excellent solution to help the concrete withstand attack from salt and to increase the lifespan of the structure. Petrobras are the largest oil producers in Brazil and one of the largest in the world.